Wobbler is easy to use as a simple PC controlled VFO for (ham)radio transceiver/receiver. To provide this service a simple program for Microsoft Windows platform was created. 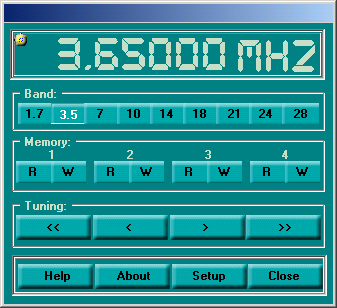 It is program, which controls an AD9850/1 DDS unit as VFO. From the wobbler hardware, of course, the whole AD part can be omitted. All important things are described in wobbler help and description. This description deals only with control program features. Band switching is allowed provided they are swithed by relays. Interface is not descrivbed here. PTT (Rx/Tx switching) is also outputed to LPT port. Port pins assignment is described in the program help. Working frequency is NOT measured, but programmatically set value (control word sent to DDS). Real accuracy depends on DDS clock accuracy. R means "read memory and set it as working frequency"
W means "save current working frequency to memory"
The same function, but with autorepeat, have 4 keyboard keys - M, ,, .and / - in the right bottom keyboard corner. 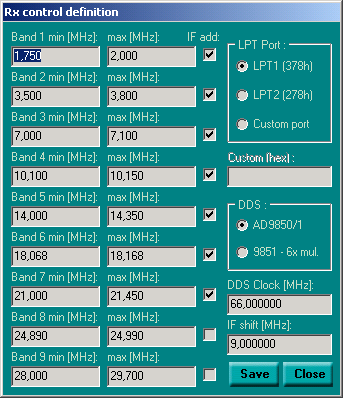 Rx/Tx switching is done by SPACE button. The only difference between Save and Close buttons is, that Save button saves the changes into rx.ini file, while Close button not. If rx.ini file doesn't exist program creates standard one. This file can be modified using Notepad or similar text editor, provided enough skill, of course.